With Alfred Morris wearing a Cowboys jersey after this past offseason, there’s a chance in the Washington backfield for a couple of players to shine and get plenty of playing time. 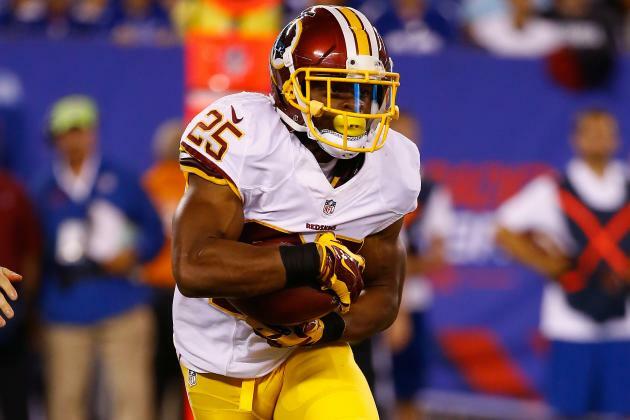 One such player is back Chris Thompson, who had a number of major injuries at Florida State, suffered a torn labrum and left shoulder injury as a rookie, and spent most of his second season on the practice squad. Now it could be Thompson’s time, as last season he appeared in 14 games, catching 35 passes for 240 yards, and rushing for 216 yards on the ground. With Morris in another, uniform, Thompson may get that playing time he’s been looking for. Thompson wants to be a better route runner. He changed his diet to stay healthy – no more Hershey’s cookies and cream unfortunately – and tried to get stronger after rehabbing his shoulder to help in pass protection. He hopes to become a better third-down back, but knows if no one else is brought in there are carries to be had. He wants to be ready. Thompson is now the “old” man in the room at age 25. He joked about how the younger backs in camp come to him for questions instead of running backs coach Randy Jordan. Jones is in his second year, running back Mack Brown was on the practice squad all last season and the three other backs in camp are rookies. Don’t lose sight of Thompson, a player with plenty to prove this season for the Redskins, and a player that is finally looking to put past injuries behind him. The season is closing in for the Redskins and the rest of the NFL, and whether you are playing the preseason slate or the regular season, grab a Ladbrokes promo code and jump online and play your favorite team today! ROBERT KELLEY, and MACK BROWN making some waves. Sounds like KELLEY may actually be the #2 back behind JONES. Doesn’t sound like THOMPSON is thrilled in becoming the #2. And last night proved it. KELLY broke off some nice runs through holes big enough for a MACK truck. And speaking of”‘MACK,” I thought as did BRIAN MITCHELL that MACK BROWN did a better job than any other REDSKIN running back. Most of his runs had a few seams and cracks, but no gaping holes. He reminded of ALFRED MORRIS, just stuck his nose in there and plowed. No flinching away from contact, or turning of the back prior to being hit like others yesterday. Hey coach, put him with the first team next week and see how he performs.